However, I'd like the Demonrat politicians to show up at my door to take them, instead of some innocent trooper. December 19, 2018. ANJRPC attorneys today filed a legal petition asking the full Third Circuit to review the December 5, 2018 decision of a 3-judge panel of the Third Circuit upholding NJ's ban on magazines holding between 11-15 rounds of ammunition. The petition seeks "rehearing en banc," a process by which every judge on the Third Circuit reviews the prior ruling by the 3-judge panel. See a copy of ANJRPC's petition for rehearing en banc here. If the full Third Circuit grants rehearing en banc, it will issue an order providing particulars of how the rehearing will proceed, which could include additional briefing and oral argument before the court. If the court declines en banc review, ANJRPC is prepared to eventually seek review from the U.S. Supreme Court. ANJRPC thanks NRA-ILA for its incredible support and guidance in the mag ban case. The case will be pursued until all appeal options are exhausted. When is the democrat judge on the third circuit retire? I could see NJ using undercover cops at gun ranges to look for illegal mags. House, to house search? I doubt it, but never say never. What probable cause would law enforcement, and a judge have for getting a search warrant for gun owners' homes? The fact that they MAY have guns? I don't think there's anything to worry about, we've been told here on the forum many times that police won't follow an unconstitutional law that involves seizure of private property without due process. Round capacity is fluid and a social construct. Noticed the Action Item List forgot to mention moving to Pennsylvania. What if my 15 round magazines believe they are 10 round magazines? Isn't that bigotry if you disagree? Here in NJ they just lay down and take it.....another group would show up at these judges homes or the Governor's Mansion and exercise their right to picket 24/7.....yup. bring out the inflatable "Rats".......OMO. 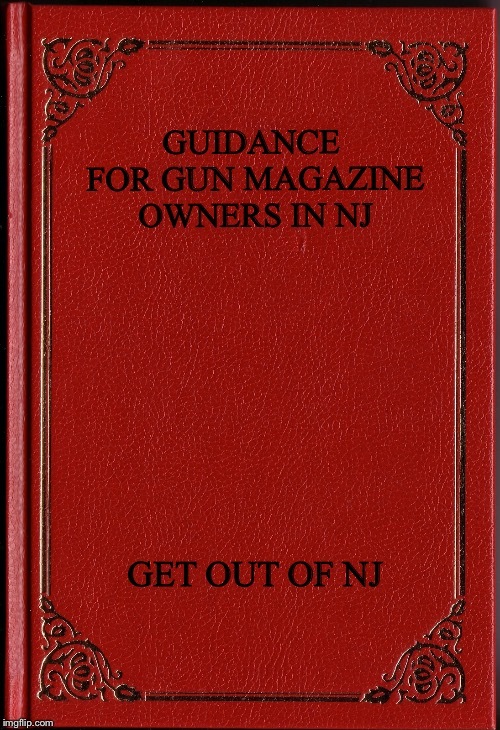 I could see NJ using undercover cops at gun ranges to look for illegal mags.